What is the real health impact of poor air quality in Greater London? 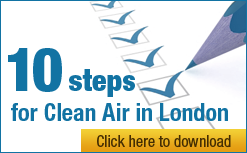 This letter is sent on behalf of the Campaign for Clean Air in London (CCAL). Details of our Mission and Supporters can be seen at cleanair.london. The primary purpose of this letter is to ask the Department of Health (DoH): for its urgent assistance to clarify the full extent of the health impact of poor air quality in Greater London; and to commit to a major public information programme to communicate updated similar information at least annually in future. Furthermore, some of the medical research to which the EEA refers (Kunzli et al, 2000), suggests that the amount of time lost per statistical victim may be 9.8 years equating to a change in life expectancy of approximately 0.6 years (7.2 months) in the total population. ∗ CCAL calculation based on latest European Environment Agency Report; Greater London assumed to have no worse than average UK exposure to PM10; and ONS population estimates for mid-2007. This new information is particularly worrying given that: the only previous premature death figure for London seen by CCAL was 1,031 premature deaths from PM10 in total in 2005; and the government’s Air Quality Strategy for England, Scotland, Wales and Northern Ireland in 2007 (AQS 2007) appears to have omitted references to premature deaths (when earlier government-sponsored publications had included them) and years of life lost. The AQS 2007 stated simply ‘estimated to reduce life expectancy of every person in the UK by an average of 7-8 months with an equivalent health cost of up to £20 billion each year’. CCAL is deeply concerned that the public health impact of poor air quality in Greater London, which is recognised – including by the government – to be the worst in the United Kingdom (UK), may be much worse than earlier research showed. In addition, why have major public information campaigns been launched on alcohol abuse, obesity, road traffic accidents and smoking – and not on poor air quality – when poor air quality is such a major killer? Similarly, why is there no-one seemingly from the DoH commenting regularly in the media on the importance of major research into the health impacts of poor air quality whenever it appears? In CCAL’s view, it is essential that people are given an opportunity to understand the full extent and seriousness of the air quality problem and the part they can play in improving the situation. The EEA Report shows in a bar chart in Figure 3.4 on page 20 the UK as having around 650 premature deaths per million inhabitants attributable to PM10 in 2005 among adults of 30 years of age and older. Table 6 of the DMAG report is titled ‘Mid-2007 Population estimates by broad age range, Greater London and London boroughs’. It shows that there were some 4,469,400 adults of 30 years of age and older in Greater London in mid-2007. The Executive summary of the EEA Report on page 5 states that ‘Measured particulate matter (PM) concentrations in Europe have not shown, in general, any downward tendencies over the period from 2000 to 2005.’ It would seem reasonable to assume therefore that the current rate of premature deaths attributable to PM10 in Greater London may still be some 2,905 among adults of 30 years of age and older. It should be possible from data in the above report to estimate also premature deaths in each local authority area across the UK. In addition, the bar chart in Figure 4.2 on page 29 of the EEA Report shows the UK as having around 10 premature deaths per million inhabitants attributable to ozone exposure in 2005. If that number is multiplied by the 7,556,900 total inhabitants in Greater London in mid-2007, Greater London experienced 75 premature deaths attributable to ozone exposure in 2005. If correct, this would take the total premature deaths attributable to PM10 and ozone to some 2,980 in Greater London in 2005. Please note that this figure includes only adults of age 30 and older for PM10. CCAL notes that meteorology, which effects air quality, was broadly average in 2005. The similarity between the 2000 and 2005 figures suggests that the extent of the health impact of dangerous airborne particulates (PM10) has been known for many years. In CCAL’s view, the time has come to step up substantially the UK’s efforts to improve air quality. CCAL asks respectfully that you reply personally, in your capacity as Secretary of State for Health, to the two primary questions at the start of the ‘Summary’ above and to the other specific questions listed below. Relevant background information appears in the two Appendices attached to this letter: ‘What are the health facts?’; and ‘What have we been told by the government and others?’. 15. Transparency – In the DoH’s view, if the answers to the above questions result in the disclosure of material new information to the general public, why has it taken a campaigning group to prompt their release? This letter asks important questions and raises serious issues about public health in Greater London. It aims to do so in a constructive and responsible manner. CCAL hopes therefore that the DoH will take this opportunity to: put the full health facts in the public domain; and commit to a major public information programme to communicate updated similar information at least annually in future. On behalf of CCAL, I look forward to receiving your response to the questions above, by electronic reply, to the confidential email address provided separately. Appendix One: What are the health facts? Search the report above on ‘premature’ and see particularly pages 5, 20 and 21. Figure 3.4 on page 20 shows around 650 deaths per million on average from PM10 in the UK in 2005 for people aged 30 and over. Note: Figure 3.4 shows 38 states not 27. See page ‘1054’ i.e. second last page which refers to ‘the amount of time lost, per statistical victim, turned out to be 9.8 years, which corresponds to a change in life expectancy of approximately 0.6 years in the total population’. Note: 0.6 years is 7.2 months. Does this include only those whose life is lost due to identifiable air pollution exposure? During London’s summer smog episode in August 2003 there were a total of between 46 and 212 premature deaths from ozone and 85 from particulate matter. London’s summer smog episode in July 2006 was likely to have resulted in a similar or greater number of premature deaths from ozone and a slightly lower number for particulate matter. Total deaths nationally from road traffic accidents in 2007 were 2,946. Appendix Two: What have we been told by the government and others? This does not seem to have a single reference to a number of premature deaths e.g. the Ministerial Foreword on page 3 of Volume 1 says ‘estimated to reduce life expectancy of every person in the UK by an average of 7-8 months with an equivalent health cost of up to £20 billion each year’.